A little more than a year ago, my mom remarried a wonderful guy, and in doing so, I, at the age of thirty, gained two step-brothers and a super-cool, somewhat bohemian, step-sister in Montana. My step-sister, Lilly, got engaged shortly thereafter and is getting married later this summer in Bozeman. I was overjoyed to design a set of custom letterpress wedding invitations just for her and her fiancé! 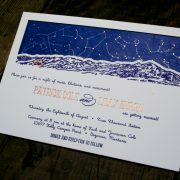 Lilly and Patrick’s invitations feature a hand-drawn range of the Tetons, which is the backdrop for their wedding venue. I was going for a rustic, yet classy, vibe which incorporated their local mountain range with some other sweet Montana-y touches. All of the pieces in their suite feature navy blue letterpress printing on thick, 100% cotton paper with accents of copper foil stamping throughout. 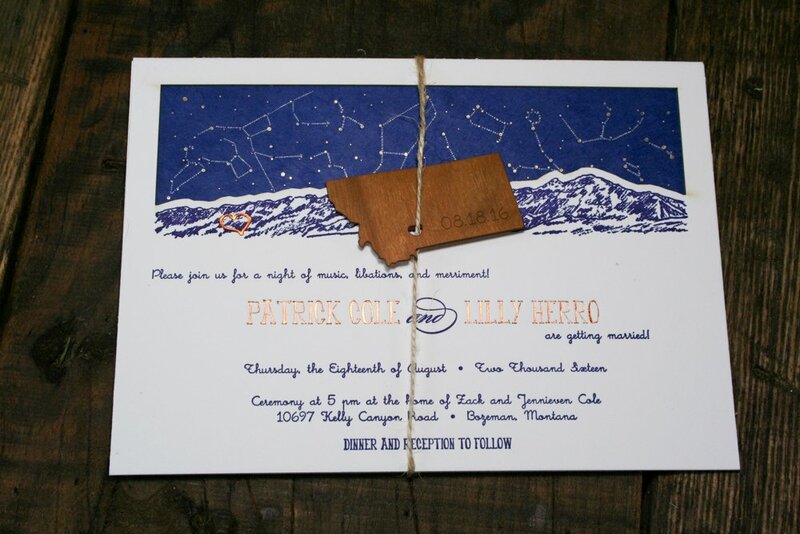 Lilly and Patrick’s standard, A7-size invitation features a hand-drawn sketch of the mountain range outside of their home in Montana, with a custom laser-cutout revealing the sky above it. 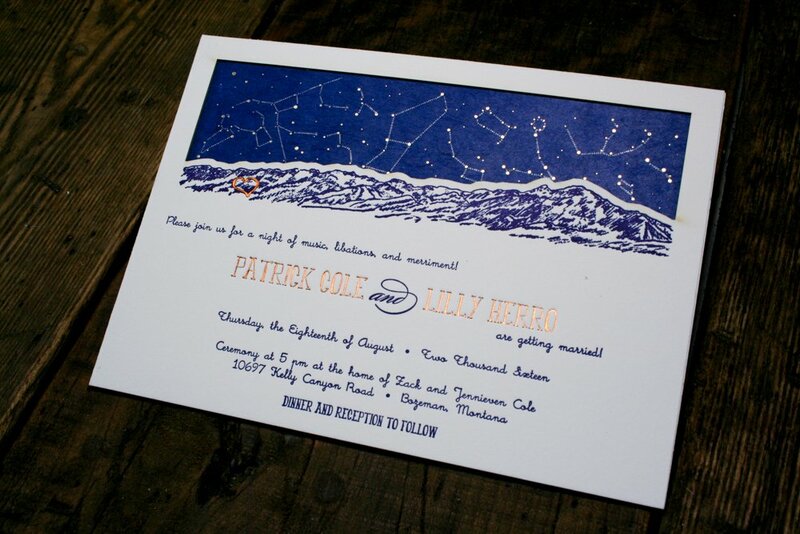 To create the sky, I used handmade blue Lokta paper from Nepal and printed the stars that will form constellations on their wedding night in gold foil, with letterpress printed lines connecting them. In the right light, all of the little stars seem to glow in the night sky, which created a really beautiful, almost three-dimensional effect. We used a combination of modern script and serif fonts for the text of their invitation printed in navy blue ink. Their names were accented with copper foil, as is a sweet heart shape in the mountains. On the backside of Lilly & Patrick’s invitation we printed a set of driving directions and a custom, hand-drawn map. 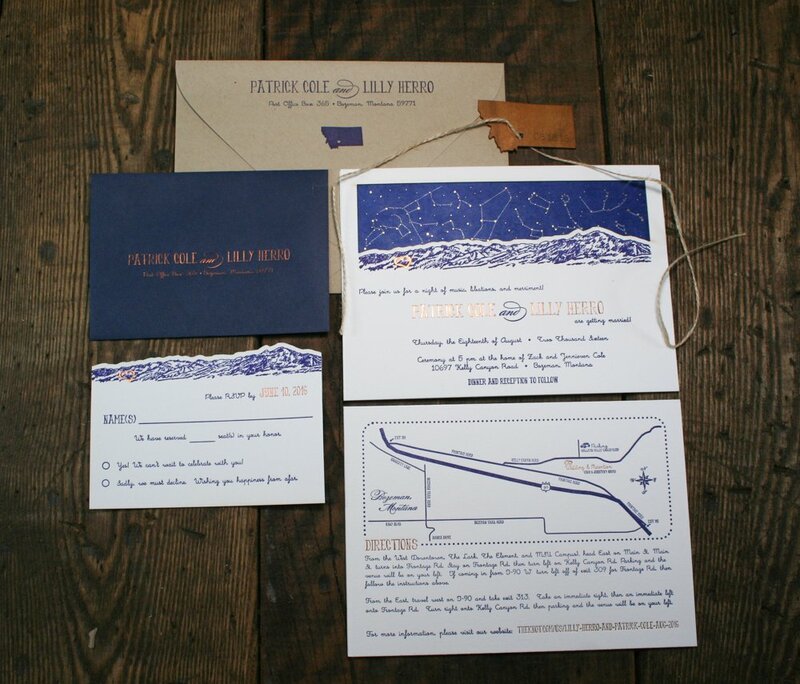 The map and directions also feature navy blue letterpress printing and copper foil stamping. 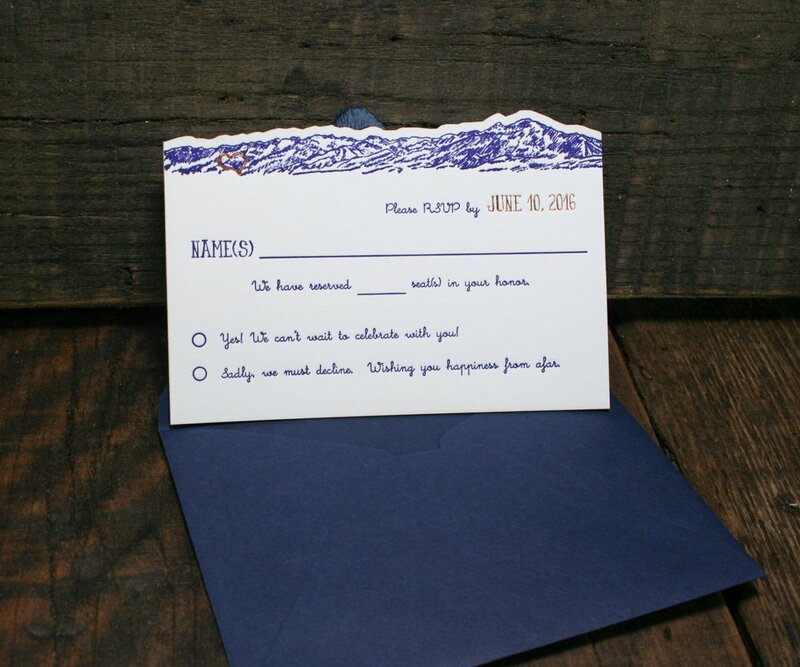 Their reply card featured the same mountain range sketch and copper heart accent. We also laser-cut the top of the card in the shape of the mountains to mimic the cutting that was done on the invitation. The reply card was paired with a matching navy blue envelope with the address printed in copper foil. 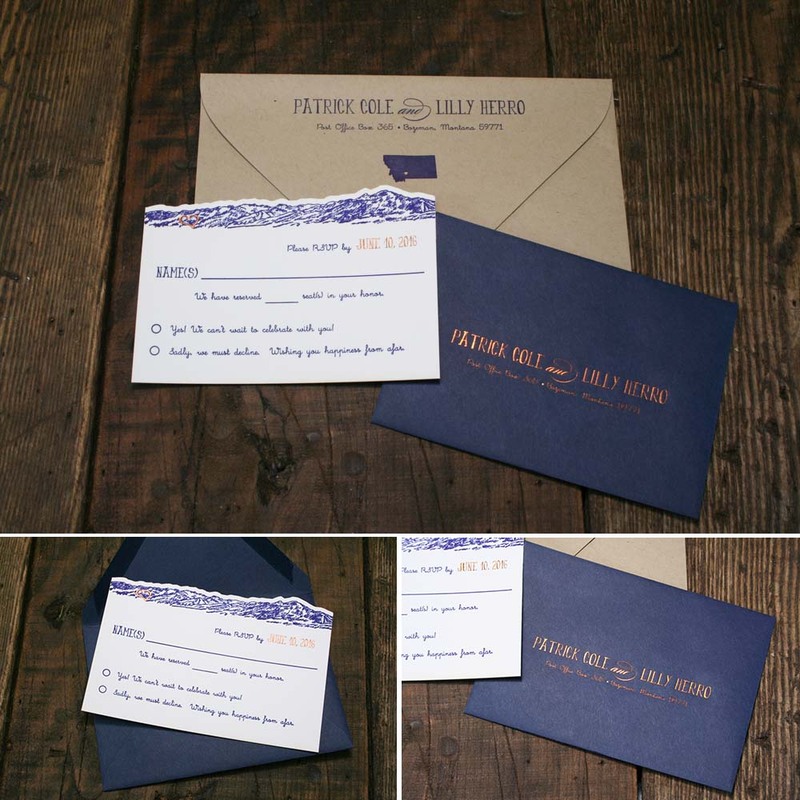 The invitation envelopes are a natural paper-bag color with navy ink. 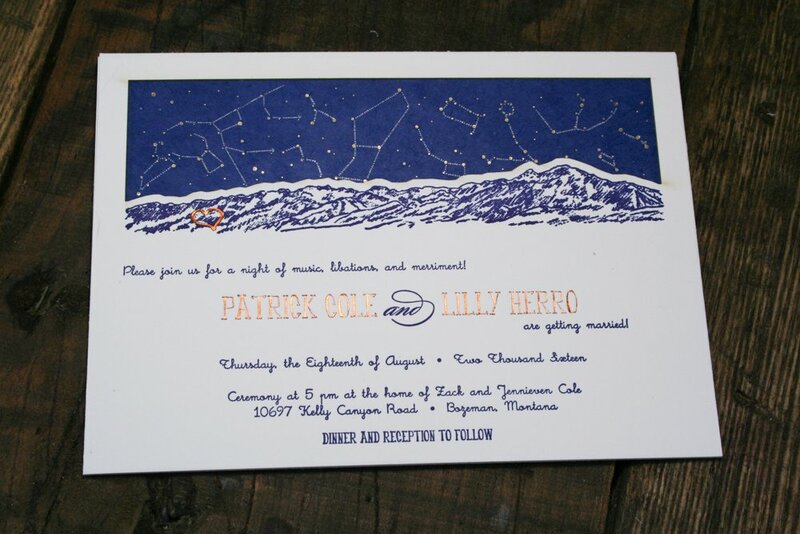 Another prominent element in Lilly & Patrick’s invitations was a reoccurring Montana shape with a small heart over Bozeman. 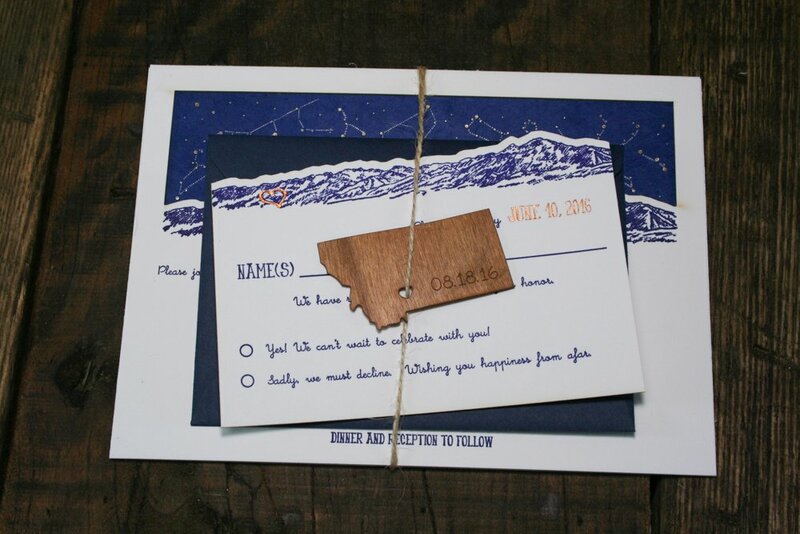 This motif was printed below the address on their invitation envelope and was also used to create a custom laser-cut wooden tag to tie their invitations together with. The tag was cut from cherry veneer and had their wedding date engraved into it. 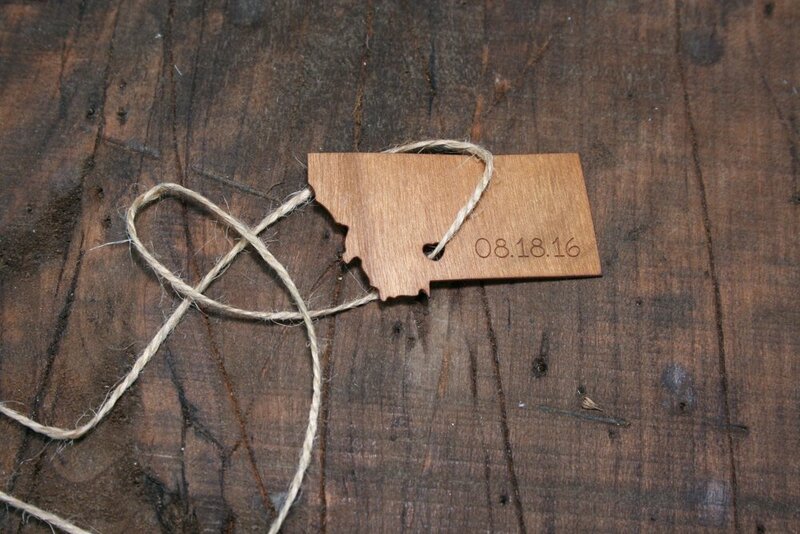 This was then tied around each invitation with rustic-looking jute twine. 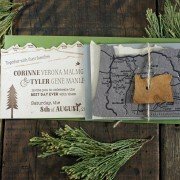 I am so happy with how unique, rustic, beautiful, and special these invitations turned out! I love that I was able to combine several elements I love into their design and that they helped set the stage for my step-sister and future-step-brother-in-law’s wedding to come!